Open Educational Resources (OER) are made free to the public under a creative commons license. Author Adam McKeePosted on October 3, 2018 October 3, 2018 Categories Open Educational ResourcesTags OERLeave a comment on What does “Open” Mean in Open Educational Resource (OER)? 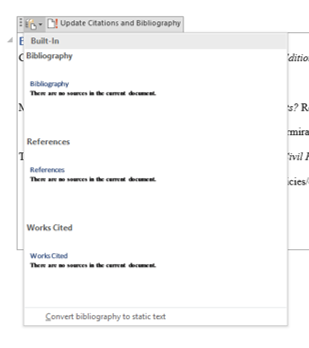 Some of you have used the “References” tool in Word to add a bibliography to your blogs and discussion posts for Blackboard, and that is an excellent tool. When you try to paste your work into something else, however, your References (bibliography) gets cut off. Word is a great tool for creating documents, but it is a terrible tool for sharing them. You will encounter many different electronic platforms that are Web (HTML) based, and your documents must look good on those these days. Blackboard is merely one example of this. To get your references to copy when you paste a document from Word into Blackboard (or WordPress, or anything else on the Web), you simply need to transform your Word document References into “static text.” The static text is just regular text, and you can cut and past that with no problem. All you need to do is highlight the Reference block of fields, and click on the “more” icon. Variousu options are available, but it is the “convert bibliography to static text” at the bottom we are interested in. Note that this can’t really be undone, so wait until you are sure everything is perfect and all of your references have been included before you do this. Once your references have been converted, you can then “select all” and copy the document to your clipboard, and then paste it into Blackboard. You may need to clean up your paragraph spacing, and such. Then you are ready to submit your document. It is readily apparent from many sources that the costs of higher education have skyrocketed in nominal dollars since the mid-1980s. Less apparent has been the rise in terms of real (inflation-adjusted) dollars. In an age of anti-intellectualism and skills-based focus by government officials, higher education has experienced an unprecedented lack of support despite a thriving economy. Despite admonishments by business luminaries such as Mark Cuban, our society has devalued a liberal education that fosters critical thinking and creativity. Flat salaries for nearly a decade have resulted in a 30% loss of buying power for college faculty and the institutions that employ them. It is a subjective judgment, but I think it fair to say that higher education in America is in a crisis. Many institutions will need to cut costs for students just to keep enrollment up, or risk coming to the office to find chains on the building doors. It is a bad strategy to assume that things will get better any time soon. The economy has peaked, and another showdown looms on the horizon. All this is to make a simple point: Cutting costs for students is critical, and we must take it seriously. If we don’t want to cut salaries, we need to save elsewhere. Astronomical textbook costs are an easy target, and the solution has been Identified. There are several important barriers to the broad implementation of OER. One is that it takes a lot of work to write a book, and a few people are altruistic enough to give it away. Many of us would rather get fleeced by a textbook company and make a pittance than we had just give it away freely. Once you have thousands of hours in a project, it is very difficult indeed to slap a Creative Commons license on it and put it out there for the world. In a world where “publish or perish” is a bona fide concern, we don’t see any way to get proper credit for such a grand, altruistic gesture. There are some other galling things about CC licenses. You give away the right to chop up your work, repackage it, and redistribute it. The “attribution license” requires that you be given credit, but you have no way of knowing whether you will even want your professional reputation tied to these new products. You can also restrict “commercial use”, which basically says other people can’t try to profit from your work. The spirit of “don’t make money off my hard work” may be written into the license, but it is not effective in practice. Big companies can repost your work “for the good of the learner,” when the real intent is to spam search engines with your content. They get a valuable rise in Google ranks, and you get nothing for a service that businesses pay handsome sums for otherwise. You also lose the quality of your work over time, because any new editions, corrections, and expansions you add will not make it into every version. Philosophically, I think Creative Commons Licenses are great and are a credit to humanity. I also think they have some glaring deficiencies for academic authors considering publishing a book as OER as opposed to selling it to the corporate giants. I propose that likeminded academic authors explore a new type of license that is inspired by the CC licenses and the GNU licenses that came before them. With this in mind, I developed what I call an “Open Education Resource-Quality Master Source License.” This license is inspired by the GNU licenses used by software developers and the Creative Commons licenses. These licenses, however, result in many iterations of content that are not updated and corrected as time passes. The purpose of the OER-QMS license is to offer content creators the right to maintain a single, high-quality source that they control and maintain such that quality can be preserved over time. Whereas the CC licenses have taken a ground up approach, my approach was to retain the basic copyright laws for traditional publishing and build a handful of exceptions that make them available as OER. Section 1 A of the license basically says this is my stuff, and if you can’t use it like I say, then you can’t use it at all. Section 1 B is the carrot. You have to adopt the book to use it, and all that means is that you must send me a note saying who you are, that you are using it, what you are using it for, and where you are using it at. Section 1 C says you can cite my stuff like you can another book in a critical review, journal article, etc. under the normal rules of scholarly publication. You can cut and paste stuff into Blackboard (or whatever LMS your institution uses) as long as your students need a password to get to it. You must give me credit, and provide a link to the URL where you got the information–some disciplines would call that a footnote. You can print stuff if you want to for your own purposes, and you can make copies for indigent students on a case by case basis. What you can’t do is print hundreds of copies and sell them in your institution’s bookstore. You can also print copies if you need them to go into those big binders for the accreditors, or whatever bureaucratic nonsense your institution makes you do. You can link to any of the material from your LMS, departmental webpage, Library OER directory, or whatever you like. I want people to use my stuff, I just want it used from my webpages so I know (and can document) that it is being used. Put it on the web, any kind of way. Link to it as much as you like, but don’t republish it. Don’t make an ebook, PDF, or any other kind of file out of it. Use the HTML in your LMS, but I don’t want a bunch of static eBooks, PDFs, or any other file types floating around that I can’t update, account for, or anything else. Don’t use my work to produce a “derivative” work. Normal citations are fine, and using the content as a complete book in your classes is fine, using just sections is fine, but I’d like my work to stay mine and hopefully get some recognition for it. I don’t think most of us in the Ivory Tower question why this is important. If you don’t work in academia, Google “publish or perish” and check out what we have to put up with. I know that since we teachers get paid so well, it can only be pure greed that motivates this, but I ask that you not try to make any money off my work, including you SEO masters out there. IF there are a few dollars to be made, I’d like to use those to pay for my domain, hosting, software, etc. And that’s it. I view this license as an exception to regular copyright laws, and as such, it can be brief. I invite you to view the more legalistic version and leave comments on either version. I’m sure that this is imperfect, but I believe that we should have the conversation and that it must begin somewhere. Author Adam McKeePosted on July 27, 2018 July 27, 2018 Categories Open Educational ResourcesLeave a comment on Are Creative Commons Licenses Best for OER? The astronomical costs of textbooks are a significant barrier to student success, and Open Educational Resources are a welcome solution to the problem. My intention here is not to advocate OER, but to describe some limitations of OER and how those limitations can be overcome by individual OER authors. A potential problem with using OER in college courses is the fact that OER textbooks exist largely in a digital universe. In rural areas, students may live where data is a premium, and they are reluctant to spend large amounts of time “logged into”an LMS. Many students, especially those of us wh.o are “pre-millennials” have a preference for good old fashioned paper books. These factors present a problem if we simply take public domain or Creative Commons Licensed books and place them in our learning management systems. To expand the reach of OER and develop student “buy-in,” individual authors can expand the delivery of OER materials via several different options. Traditional academic books required that you write a proposal, send it to an editor and repeating the time-consuming process until one took an interest. If you were lucky enough to get a contract, you did a massive amount of work, and the book publisher made a lot of money. I don’t know a single academic that has reached the level of “well off” through book royalties. These days, the traditional textbook companies have nearly priced themselves out of business, and other modes of content delivery have risen to prominence. We all understand that anyone can start a web page, and content management systems like WordPress have made it easier than ever to do so. If you have the subject matter expertise and the willingness to work hard for the betterment of student kind, then you too can be an OER author. The most common form of OER is to write a traditional book, save it as a PDF file, and post it online. When it comes to student needs and preferences, this is about the worst thing you can do. In my professional life, I am biased toward desktop computers with big screens and lots of processing power. I often fail to remember that my students are much more likely to access my materials on a smartphone which means a tiny screen. Because PDF files retain your original formatting, they are very difficult to read on a small screen. If you have tried this, you know exactly what I’m talking about. If you have not tried it, I encourage you to do so. PDF files are great for professionals, but they are terrible for students. My suggestion is to first publish your OER materials as HTML files (aka web pages). There are many ways to do this, but I suggest that you strongly consider the option of starting your own website and building a brand. This isn’t meant to fuel your ego, but to provide easy access, a common source that you control and keep updated, and Search Engine Optimization (SEO). If you want your colleagues to use your work, they need to be able to find it. I well desinged web presence can provide many benefits, and keep your materials in a nice, neat, and easily found location. I strongly suggest that you use a modern, device sensitive Content Management System (CMS) to build your web presence. There are many optinos, but I strongly recommend the WordPress option, which has been made famous by the rise of blogging, and more websites are “powered by WordPress” than any other software. Just as we academics have OER, software folks have “open source” and that is what WordPress (and its thousands of plug-ins) is. WordPress has some powerful capabilities, one of which is to optimize your content for whatever screen you find it on. That means you see a quality product on your big screen in your office, your tablet at home, and your student’s see quality, readable content on their smartphones. If you want to go the extra mile and provide your students with an “eBook” version of your project, you can do that via Amazon.com’s Kindle Direct Program (KDP). Amazon is a for profit business, but they allow you to charge nothing for your Kindle book because “free books” draw more users to the Kindle ecosystem, and that is good for business. If you create your document in MS Word, KDP has free software that converts it into a very simple print book format (via a new tab) or you can get more advanced software designed to build textbooks (expect a learning curve with the more powerful software). Once you have your Kindle book built, you can easily convert it to a paper book, and Amazon will house your book for free, and when someone orders a copy, they will print it and mail it out. This is not a free option, but an attractive book delivered is cheaper than printing PDF files of the same size at your local business center or university library (where $0.10 per page seems to be the gold standard). My preference is to set my price point where I make around $1.00 per book sold on Amazon to help defray the costs of maintaining my website. If you want a better looking product, you can consider “self publishing” firms such as Booklocker.com. There are some fees involved, especially for first time authors, but you get a lot of professional services for your money, and the product is of superior quality to what most people can do with Amazon’s automated services. If, in the end, you have a digital version of your OER textbook online, an eBook version available for download to a reader, and a print version that is available at very low cost, you will have captured most of the available options. Multiple formats of your OER books will appeal to the maximum number of students, and provide alternatives to expensive textbooks at no or very little cost. This removes a significant barrier to student success. I first heard about OER by that name when listening to a presentation on the University of Arkansas System’s eVersity initiative led by Dr. Michael Moore in late 2014. I had maintained a website for most of my professional career, and have used it to post study guides, notes, and so forth. I had also used online documents—mostly government publications—as class readings. I had been posting study guides and such online for years, but the idea that complete course could be sourced with free online materials intended for educational purposes never occurred to me. My misconception at that time was that only very technical material was available in the public domain. That is, you could do a graduate course with free materials (original research reports, law review articles, government agency technical reports, etc. ), but undergraduates needed material geared toward their level of knowledge and experience. To my way of thinking at the time, there was no middle ground between sources that “anyone can edit” and highly sophisticated academic publications. Any discussion of OER brings up questions of quality. Are your OER resources as high in quality as the traditional resources everyone else seems to be using? A direct comparison between my OER materials and a $200 hardback textbook may not be in order. We first must take into account the fact that a large number of my students were not actually buying the textbook because of the “sticker price.” Any assignments based on the unpurchased text were not getting done, and the assumption that students were keeping up with the readings was patently false in many cases. For a long time, I selected texts based on pedagogical concerns. I must also confess that I was influenced by how easy those texts made my life. The more ancillary materials, the more favorably I looked on the text. I never thought to check how much it was going to cost students. I knew that textbooks were expensive in an abstract sense, but I did not realize that some students were paying more for textbooks than for tuition. In hindsight, I now realize that the textbook publishers had colored my thinking about how to design a course very early in my career. Lacking any firm foundation in pedagogy, my process essentially involved selecting a text and designing a syllabus around it. I didn’t realize it at the time, but I wasn’t teaching courses. I was teaching textbooks. As I gained experience, I realized that textbooks tend to be bloated, and some chapters are essentially filler. I stopped assigning a chapter a week and started thinking about what my course was supposed to impart to the learner. I concluded that in many circumstances, depth was more important than breadth, and that the ubiquitous “Future of Your Discipline” chapter at the end of the text was purely speculative and not very useful. We all see our professional self through a particular lens. Some of us teach, but primarily consider ourselves to be researchers. Some of us consider ourselves golfers, and just teach to pay the bills. With some introspection, I have determined that my ego identity is intricately linked to my role as a teacher. The ultimate criterion of how good I am at this defining role is student learning. Amazingly, I never really applied this elegantly simple fact to my process. My process evolved from accidents of history; I taught my classes the way my professors taught their classes. I imagine that this progression has gone on in the ivory tower since the middle ages. Certainly, we’ve added new window dressings. My professors used chalkboards, whereas I use data projectors. Nevertheless, the basic method of “talk and chalk” has not changed on a fundamental level in a millennium. The education literature is full of caveats and empirical support for better methods and procedures, but this is not my literature. My literature revolves around how law enforcement can make our streets safer. I didn’t realize it at the time, but when I made the decision to join the eVersity team, I had swallowed the red pill. I would be forced to confront my deeply rooted paradigm of how higher education should work, and watch it crumble under the weight of evidence-based best practices that I was confronted with at every turn. The status quo was not sacred, and there were better ways of doing things. My practices were effete and based on tradition rather than the empirical evidence that I long claimed to hold dear as a social scientist. Perhaps the most important reality that I was forced to face was the fact that students tend not to buy overpriced textbooks. My paradigm was rooted in the idea that students would read the course materials that I assigned, and that this would fuel brilliant intellectual discourse in the next class session. That faulty assumption failed to withstand the light of empirical research as well as my personal experiences. I knew that many students were not reading, but it never occurred to me that this was because they simply were not buying the textbook. One of the most prevalent arguments I heard against OER was quality control. Simply put, OER is not vetted for quality in any way. While this argument may sound valid on a prima facie basis, it is not logically consistent on closer examination. Textbooks, unlike journal articles, are not usually peer-reviewed. An editor whose job it is to sell expensive textbooks, not serve as a gatekeeper for the professional literature, editorially reviews them. The ultimate flaw in this argument is the very fact that the people making the argument are Subject Matter Experts (SMEs in the literature). They have terminal degrees in their respective fields. They have conducted research in those areas. Who better to vet OER materials for quality than those tasked with teaching the material? I submit that if a professor is uncomfortable judging the quality of educational resources, then he or she is not an expert in the field and has no place in the classroom. In the final analysis, support of this argument is tantamount to admitting that you are a fraud. Before you take the red pill, there are some things you should consider. Many have complained that there is no central “comprehensive catalog of resources.” This thinking reflects the old paradigm; a search for a complete package that replicates what the textbook publishers have to offer. The beauty of OER is that it allows you to teach exactly what you want to teach the way you want to teach it. If it does not fit your vision of what your course should be, you simply reject it and move on to something else. This means curation of resources on the smallest of levels. Do not think of a course as a textbook; think of it as a mosaic of facts and ideas that you and your students produce through synergy. The questions that you must ask yourself are simple: What facts and ideas do I want my students to learn? What is the absolute best way to present that information to my learners? Once you have answered these questions, you are ready to dive into the rabbit hole; you will find to your dismay that the rabbit hole is very, very deep.